Prince Harry and Meghan Markle kiss on the steps of St. George's Chapel shortly after being married on Saturday. It was their first kiss as husband and wife. 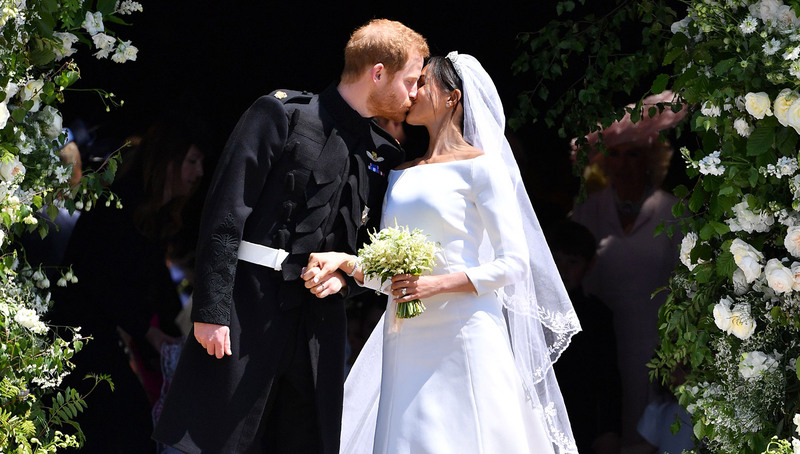 With millions watching around the world Saturday, Britain’s Prince Harry married American Meghan Markle in a ceremony that combined British pageantry with modern style. After the wedding, the couple rode through the town of Windsor in a horse-drawn carriage, greeting people along a two-mile procession. People came from far and wide to get a glimpse of the newlyweds and be a part of the local festivities. The day will end with a couple of receptions: one in the afternoon hosted by Harry’s grandmother, Queen Elizabeth II, and another at night hosted by his father, Prince Charles.